Media captionLondon Mayor Sadiq Khan: "We must stop talking about ourselves"
Labour can only win elections if it reaches beyond its own activists to a "big tent" of people, the newly-elected mayor of London has warned. 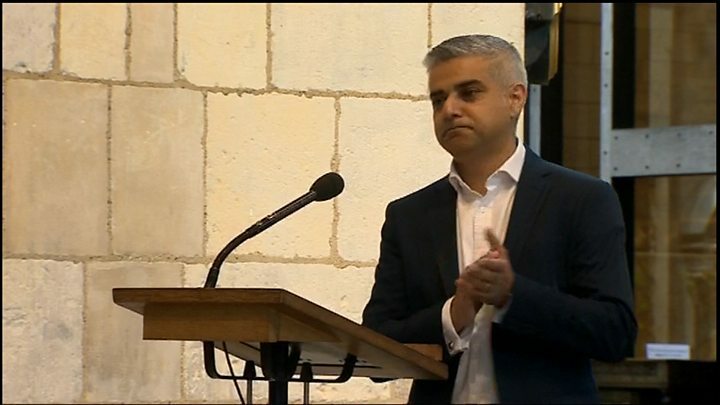 Labour's Sadiq Khan said it must put internal squabbles aside to "talk about the issues that matter to citizens". Mr Khan said Conservative candidate Zac Goldsmith ran a "nasty" campaign which put minority groups off politics. But Chancellor George Osborne defended the Tory MP, saying the "rough and tumble" was part of elections. Mr Khan stopped short of condemning the Tories' London mayoral election campaign as racist. "I was disappointed that the Conservatives party chose to have a campaign that was nasty, negative and divisive," he told the Andrew Marr Show. "I have spent my entire life encouraging minority communities to get involved in civil society, in mainstream politics. I've been fighting extremism and radicalisation all my life. "You should conduct [politics] in a positive way to enthuse people to get involved." Asked about the tone of the Conservative campaign, Mr Osborne told Robert Peston on ITV's Peston on Sunday: "Politics is a robust thing in a democracy. Elections... There's a lot of rough and tumble." And he backed Mr Goldsmith, saying: "I went campaigning with Zac, there was a positive campaign there, obviously it didn't work in the end. "Of course he's got a future, he's a brilliant MP for Richmond." Also responding to a questions about Mr Goldsmith's campaign, former communities secretary Eric Pickles said: "I think the campaign's over now, let's move on." In Sunday's Observer newspaper, Mr Khan described Conservative tactics of suggesting London was not secure with him as mayor as "straight out of the Donald Trump playbook". He told the BBC he was instead concentrating on "a positive vision for our city". "How are we going to tackle the housing crisis? What are the challenges in relation to fares going through the roof? "How do we support businesses to grow and expand so more Londoners can get a living wage? How do we bring back neighbourhood policing, and the issue of security?" Labour's mission was to "change people's lives for the better", he said, adding that they did that by winning elections. Speaking later in the day at a Holocaust memorial event, at which he sat next to Chief Rabbi Ephraim Mirvis, Mr Khan said: "I see myself as a unifier." Labour leader Jeremy Corbyn was absent from Mr Khan's signing in as mayor on Saturday, instead choosing to visit Bristol's new mayor Marvin Rees. Mr Corbyn has been embroiled in a row over anti-Semitism within the party. Mr Khan's victory ends eight years of Conservative leadership at City Hall, under Boris Johnson. Mr Khan, who has confirmed that he will be standing down as MP for Tooting after win the mayoralty, said Labour had to stop talking about internal issues and reach beyond the core Labour vote. "I want a big tent. We want to speak to everyone, there's no point us just speaking to Labour voters," he told the BBC. "That means me speaking to chief executives, to people who voted Conservative last time, UKIP, or stayed at home." BBC political correspondent Eleanor Garnier said Mr Khan's comments would be seen as a message not just to Jeremy Corbyn but also to the Labour leader's critics. Former Labour minister Caroline Flint said the Labour leadership needed to "make a hell of a lot more progress" after the local election results. "This is the worst result for an opposition party after a general election in 30 years. We need to be making far more inroads to be within an opportunity to win in 2020," she told the BBC's Sunday Politics. Shadow Scottish secretary Ian Murray, Labour's only MP in Scotland, backed the mayor. He told the BBC's Pienaar's Politics Labour needed "a much wider viewpoint" as feedback showed people "don't see Jeremy Corbyn and the Labour Party at the moment as being a credible party". As well as the mayoral election, Thursday saw a total of 2,747 seats in English councils - spanning metropolitan boroughs, unitary authorities and district councils - up for grabs, along with seats in the Scottish Parliament and Welsh and Northern Irish assemblies. Scotland's First Minister Nicola Sturgeon said the SNP would try to find common ground with opposition parties as her party celebrated its third successive victory in the Holyrood election - though the result left the SNP two seats short of a majority in the parliament. In Northern Ireland the Democratic Unionists remain the biggest party in the Assembly, with Arlene Foster continuing as first minister. In English council polls Labour's vote share was down about 6% on average on 2012 - the last time the seats were contested - with 24 fewer councillors. But its share is up 4% on the general election in key wards, with the Conservatives down by a similar amount. In Wales, Labour is likely to seek to form a minority government after winning 29 of the 60 seats in Thursday's election. The party's vote is down by eight points overall, the Conservative vote is down by three points, and Plaid Cymru is up by two points. UKIP increased its vote by 12 points and saw seven candidates elected. The new mayor did not have a privileged start in life. He was one of eight children born to Pakistani immigrants, a bus driver and a seamstress, on a south London housing estate. From an early age, he showed a firm resolve to defy the odds in order to win success for himself and the causes important to him. That resolve has won him the biggest personal mandate in the UK, a job with wide-ranging powers over London and with enormous emotional significance for him. Some question whether he has the experience or record of good judgement necessary for the role. He insists he is there to represent all Londoners and to tackle inequality in the capital, and now he has the chance to prove it.